Heartland B-cycles are available for anyone to use. If you’re looking for a way to add some activity to your day or to get from one place to another on campus or in the community, the B-cycles can be checked out at your convenience. You can buy a monthly pass at the station or the B-cycle mobile app. All passes include unlimited 1-hour trips that start when you check a bike out of one station and end when you return it to any other station in the system. Additional options are available. Bicyclists are required to follow the same rules of the road as motorists, should abide by state bicycle laws, and are encouraged to wear a helmet. Our campus is connected to the Field Club Trail which connects to the Keystone Trail and the rest of the Papio Trail system. B-cycles are another form of active transportation with many benefits—studies have shown that biking also has many health benefits, both physically and mentally, and daily exercise helps relieve stress and anxiety. With your membership, you can track your distance ridden, estimate calories burned and calculate the carbon emissions you have offset by choosing to commute using a bicycle instead of your car. If you choose to do so, make sure you get the other free benefits associated with TravelSmart! The Heartland B-cycle expansion means there are more than 70 stations right here in Omaha, from Aksarben to the River’s Edge Park, as well as Chalco Hills. 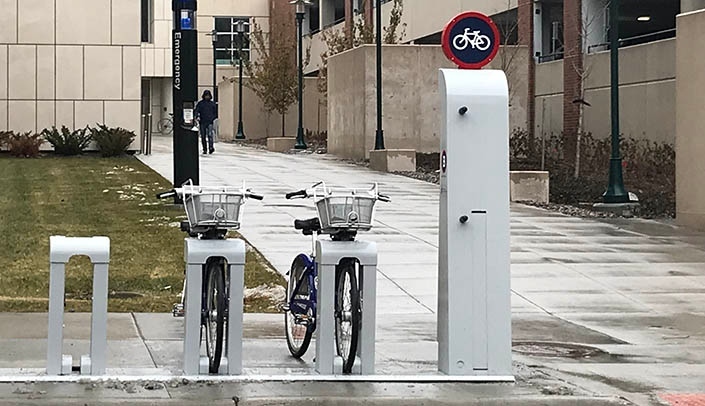 Whether you need to head west and go to UNO or east to Blackstone, Midtown or Downtown, there’s a B-cycle station conveniently located to get you there. Hungry for lunch but don’t want to use all your time to walk to your parking lot and drive a block or two? Check out a bike at a station near you and burn off some extra calories before and after lunch.